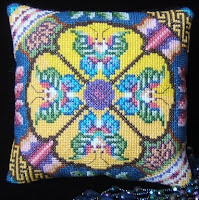 My latest mini cushion design was inspired by a photo I saw in 'Stitch' magazine of an Imperial Chinese Robe (photo below) dated around 1875-1908. I just loved the bright yellow against the royal blue and I had fun designing my own repeating butterfly motif in a rainbow of colours. 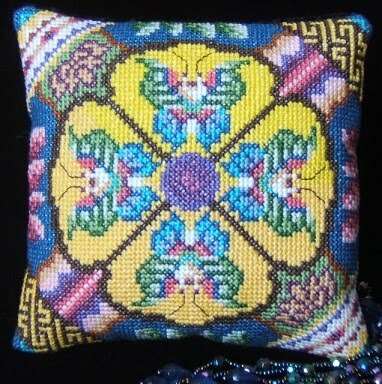 I'm guessing the flowers are magnolias so I've interpreted those down the edges of my mini cushion. And I added the brown and gold maze-like motif which edges the robe to two corners of the design. The kit is now available in my webshop and seeing all of the lively thread colours together on the sorter makes it quite irresistable!